COPD can be annoying when you can feel the congestion in your lungs, but you struggle to expel any mucus. Not only can mucus production increase, but mucus can change as we age and it can be damaging to our health. There are a few techniques to help you bring up mucus and expel it from the body. If the mucus is not expelled, breathing can become very difficult and infection can occur. There are medications that can also help with bringing up mucus. 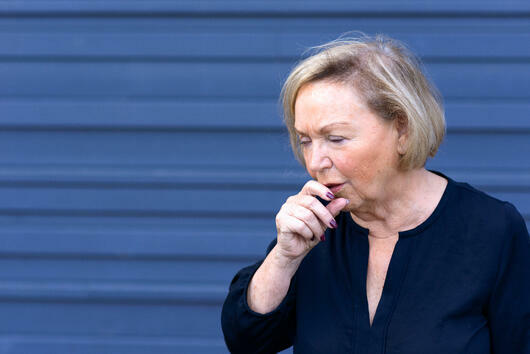 For those with COPD, mucus is produced more that those who do not have a lung disease, but why? Cigarette smoke is an irritant to the lungs, which then causes the lungs to produce more mucus to protect them from the irritant. It is common for those with a long-term cough that produces mucus to have a higher mucus production. This is because coughing can produce more mucus, so as you cough to rid your body of mucus, you then produce more. Mucus production may also increase during a flare-up, commonly due to an inhaled irritant. Other causes of excess mucus can be because of the cilia (little hairs that help move mucus from the lungs to the mouth) can be damaged and is then unable to remove mucus from the lungs. Cilia is often damaged from smoking, which is also the leading cause of COPD. This connection could be a huge reason as to why those with COPD have an excess amount of mucus. When mucus changes, it can also affect trying to expel mucus. As mucus is produced it tends to have the same clear color, but it can change depending on your health. If you have an infection in your lungs, mucus changes can often helps notify you that there is something wrong. Mucus can change from clear to white, yellow, green or reddish which can mean infection. It is often recommended to cough up mucus into a white tissue, so you know if it has an abnormal color or not. If the color has changed, a trip to the doctor is important so they can diagnose what is causing the change in color. Mucus can also change in consistency, by becoming thicker. One way to treat the thickening of mucus is to drink plenty of fluids (but try to stick to clear fluids, like water). Clear fluids can help thin mucus, which can make it easier to expel. Not only can too much mucus be a nuisance, but it can actually cause issues with your health. Your lung health can decline if there is too much mucus production, as mucus can make it hard for your lungs to take in and breathe out air. Quality of life can decrease in those with COPD and excess mucus production as it can prevent them from being physically active. Those with COPD and excess mucus production are also at a higher risk of having exacerbations and hospitalizations. Always discuss expelling techniques with your doctor so you can practice and better understand the proper technique. Deep Coughing: This technique has you start by taking a deep breath and holding it for a couple seconds. As you exhale, release a cough using your stomach muscles to push the air out. This should hopefully also bring up mucus in the lungs, but try to avoid a throat cough. Huff Coughing: If you are not having success with deep coughing, huff coughing is a great alternative. Similarly, to a deep cough, take in a deep breath and hold for 2-3 seconds but as you exhale, use your stomach muscles to make 3 rapid exhalations. The sound will be a “ha ha ha” sound and will use more of your diaphragm. Your doctor may deem both techniques are ineffective and will resort to prescribing medications that can help you expel the mucus. Speak with your doctor about what technique does/does not work for you and see what else they may recommend. If both methods do not work for you or they do not expel enough mucus, your doctor may recommend chest physiotherapy, expectorants or a more natural remedy. Chest physiotherapy (CPT) is a technique used with a partner, or alone with a device. Manual CPT is performed with percussion (when cupped hands are clapped against the chest/back) and vibration (when flat hands vibrate the chest wall) to loosen mucus and help induce a mucus-producing cough. When using a device (that is often a vest you wear or a flute-like object) it produces high-frequency vibrations and low-frequency sound waves to break up mucus and make it easier to expel, and no need for a partner. This technique is often done on a regular basis so that mucus does not build up inside the lungs. Expectorants are oral medications (both over-the-counter and prescribed) that can help thin mucus to make it easier to cough up and expel. Natural remedies for mucus build up can vary depending on the person and amount of mucus produced. Sometimes more natural remedies are better for your overall health compared to prescription medications. 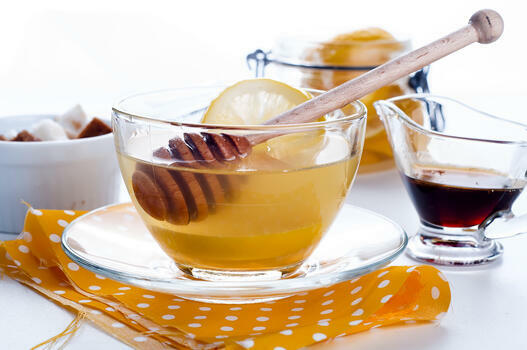 Natural remedies such as warm water, steam, and honey can be beneficial to your mucus production. You can even use these remedies as an additional step with other treatments listed. Warm fluids can help loosen mucus in the lungs (as warm fluids can raise the temperature in the chest). Warm fluids such as tea, warm broth, or hot water (with a bit of lemon and honey) can help warm the chest. Steam is also great for loosening mucus, as the moisture can prevent the mucus from getting too thick and being unable to expel it. Using a humidifier or jumping into a hot shower can be beneficial to loosening mucus as well. If it is too hard to shower in hot water, bring a chair into the bathroom and sit while you run a hot shower (just don’t shower). Honey has some amazing health properties, such an anti-inflammatory and antibacterial. Adding honey to warm water to drink or adding it to a pot of boiling water and breathing in the steam can both help lessen the strain on the lungs as well as loosen mucus. Though excess mucus is a pain to deal with, there are techniques and medications that can help rid your body of it. As mucus can change, the techniques and medications you use may also need to change to combat the mucus. Your doctor can best advise you on what you should do to help mucus build up and possibly prescribe medications to make it easier on you.